A commentary in yesterday’s Community Dentistry and Oral Epidemiology reveals tooth decay rates did not increase faster after fluoridation stopped in Calgary as claimed in a previously published study (McLaren, et al 2016).Chris Neurath led the team that reports McLaren’s study is scientifically inaccurate, uses incomplete data, and relies on two populations that are not similar, reports the Fluoride Action Network (FAN). 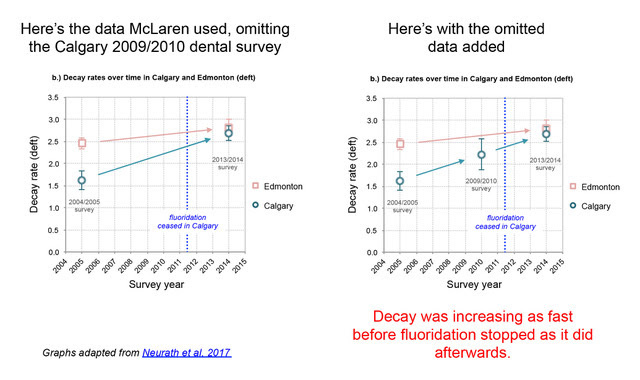 McLaren used older survey data from 6.5 years before Calgary stopped fluoridation and excluded more relevant data from 1.5 years before cessation. Including the more current data revealed that tooth decay rose in Calgary at the same rate both before and after fluoridation was stopped. Factors other than fluoridation must account for the steady increase in decay. This is confirmed by a large increase in decay in the “control” city of Edmonton, which had long-standing continuous fluoridation. Fluoridation was unable to prevent that increase in decay. “These findings negate McLaren’s conclusion that fluoridation cessation caused an increase in decay,” says Neurath. The study design is vulnerable to confounding by caries risk factors other than fluoridation. Baseline decay rates for the two cities differed substantially. Other risk factors for decay were not controlled for in either Calgary orEdmonton. There was low participation in the dental surveys and inadequate analysis to check whether this may have skewed results. “Our commentary shows that McLaren’s study design is too weak to meet minimum quality criteria set up by the prestigious Cochrane Collaborative in their recent review of fluoridation effectiveness,” says Neurath. McLaren has heavily promoted her work throughout Canada, and especially in Calgary where there have been efforts to reverse the city council’s 11 to 3 vote that stopped fluoridation in 2011. See Calgary City Council Candidate Positions on Fluoridation.